For Pacific Island countries, the ACP grouping is a important forum to find common cause with other small and developing states. This week ministers from 15 Pacific Island states headed to Lomé, the capital of Togo, for the Council of Ministers meeting of the African, Caribbean, and Pacific Group of States (ACP), and the organization’s subsequent joint meeting with the European Union. The ACP was established by the Georgetown Agreement in 1975, and comprises 79 countries from the three regions (although the north African states of the Maghreb, and Egypt, are not involved in the group). The forum remains an important institution for small and developing states to find common interests that they can collectively pursue internationally. This is an especially important multilateral institution for Pacific Island countries as it adds considerable weight to their influence. Small states tend to prefer institutions such as the ACP to bilateral arrangements as a way of finding common interests with like-minded states, or states with similar concerns. If issues of concern are able to be adopted and internalized by the institution these smaller states are able to develop a power disproportionate to their size. Therefore concentrating their capacity to negotiate on specific issues, rather than a broad range, can prove fruitful. 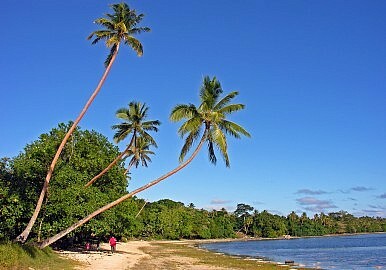 For Pacific Island countries, the primary concern at present is climate change. With a number of Pacific states facing existential threats from rising sea levels, and increased volatile weather activity causing significant and repeated damage, stretching their resources, the ability to shift the recognition and the behavior of other states has become paramount. With both its presidency of the COP23 Climate Change Conference, and its desire to demonstrate its regional leadership, Fiji continues to be the Pacific’s champion on issues concerning climate change. Prior to the APC meeting, Prime Minister Frank Bainimarama stated that “in the upcoming negotiations, Fiji will be pushing for an even greater focus on sustainable, resilient development, and space for accommodating developing and climate-vulnerable small island states, increasing regional trade and integration and making development financing more accessible.” Pacific Island states would undoubtedly find allies in Caribbean countries, which also are particularly vulnerable to the effects of climate change. The ACP Group was originally created with the aim of finding joint positions within its membership in order to increase their respective weight in coordinating cooperation with the then-European Economic Community (EEC), now the European Union (EU). This remains the primary focus of the group, and it is currently organized through the Cotonou Agreement, which all members of the APC have signed except Cuba. The agreement governs trade and development cooperation, as well as obligations such as good governance and human rights. However, the agreement is set to expire in 2020 and much of the focus of the current ACP meeting has been on developing an agreed-upon negotiating mandate for the group for the post-Cotonou period. The negotiating agreement initially struggled to find consensus over issues of migration. For Pacific Island states divorced from issues concerning migration into the EU, this stumbling block served to highlight the geographical oddity of the organization, where the goals of Pacific Islands states could be overwhelmed by prominent issues between the EU and African states. However, the benefits of remaining engaged despite this hurdle continue to be pronounced for these countries and the final document produced a number of prominent “Cross-Cutting Themes” such as Vulnerability and Resilience, Oceans and Seas, and Climate Change that would have been high on the agenda for the Pacific bloc. The document also recognizes that that increased trade and investment, as well as technological advancement and innovation, offer potential solutions — or at least assistance — to the sustainability of Small Island Developing States (SIDS), and in particular the United Nations-designated Least Developed Countries (LDCs), four of which are in the Pacific — Kiribati, Solomon Islands, Tuvalu, and Vanuatu. While the ACP promotes a conviction of South-South solidarity, it remains an institution of divergent geographies, interests, and levels of powers. In particular, the large and growing countries in Africa will see their increasing power and capabilities overwhelm Pacific Island states’ in the coming decades. How this affects the structure of the ACP, and their interest in maintaining the forum, will become an increasing concern. However, for now, the opportunity for the smaller Pacific countries to gain an opportunity to have their voices heard and considered, and keep their interests on the agenda with larger spheres of power, is a positive one. The forum also affords Pacific countries an ability to engage with states that they may otherwise have no reason have regular contact with in the hope of finding more states sympathetic to their interests. Vanuatu has used this ACP-EU summit to establish diplomatic relations with both Bulgaria and Romania, demonstrating a desire to continually expand their diplomatic reach. That desire will most likely become an increasingly important asset in the forthcoming decades.